Used modular church building for sale. Ready to find a modular church building or classroom? Use the form below and get floor plans, pictures and price quotes today. I receive calls from around the country every month from churches and schools that have used modular church buildings and portable classrooms to sell for discounted prices. For example, I received a call yesterday from a church in Georgia that has a used 24' x 60' modular church building that is no longer needed now that construction of the main school building is completed. With construction completed it's time for the modular church building to find another home...and quickly. This is very typical and my job is to help readers like you find these opportunities. Every time I am able to match a willing buyer with a motivated seller - I am a happy camper and everyone seems to win. The modular building is sold at a very attractive price and the seller is free and clear of the modular building asset. If you are interested in finding a good deal on a used modular church building or portable classroom try using the form below. This form has helped thousands of people shop, compare price quotes and save money on used modular church buildings across the United States. How do I buy a used modular classroom in California? 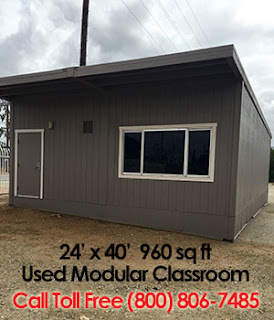 California suppliers of used modular classrooms and California public schools have thousands of used "portables"available for sale...and my job is to help you find them at the best possible price. The trick is knowing where the used modulars are located and knowing how to source them quickly and affordably. If you are looking for classroom or office space a modular is typically a great option...and it's an affordable solution that can be implemented quickly. Just be sure that your local building and safety department will permit you to place the modular on your property and that you have enough space for people to easily access the modular. You can schedule and appointment with your building department easily and they will know exactly how to advise you. If you have the location and your local building authorities have given you the green light to use a modular classroom you are just a few steps away from an instant space solution. "We are researching using a modular locker room building for our athletic department team room and a facility for showers. Can you help us locate something like this for our school campus?" Check with your local modular supplier if you have a need for any type of modular locker room with or without showers and toilets. In many cases you will be able to rent an available used model or make modifications to an existing floor plan to suit your needs. If you can't find the right model you may want to explore having a new modular locker building manufactured for your specific needs. 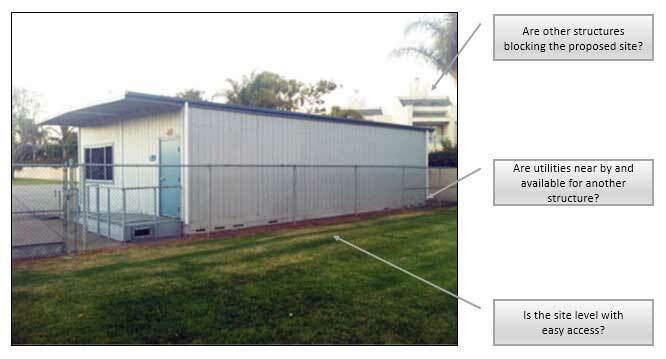 Want to find a modular locker room trailer today? Try our supplier price comparison tool and get the floor plan you need at the best available price in your area - it takes 2 minutes to send your request to local suppliers who will call you the same day with answers, floor plans and price quotes to rent or buy. Here is another helpful post about modular shower, locker and change rooms. 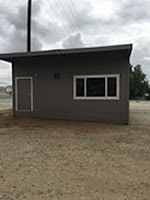 This is not my typical "how to find the best price on a portable classroom" post because sometimes using a portable modular building isn't the best option for your business, church or school. 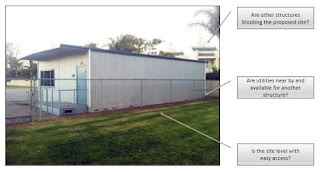 While portables are a fast and flexible way to get space quickly and cost effectively - sometimes there are obstacles that make using a portable classroom too expensive. 1. No land. Believe it or not some campuses simply don't have the room to accommodate a 24' x 40' or 24' x 60' portable classroom. Squeezing another structure onto the property could cause permitting problems, fire hazards or even security issues. 2. Other structures are blocking the proposed site for the portable classroom. 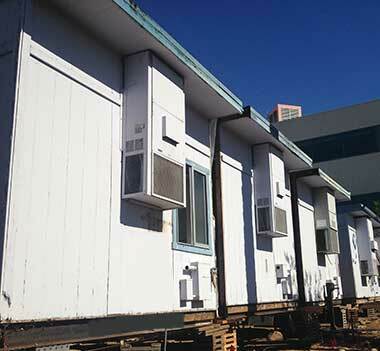 When you need to use a crane to install a portable modular building the costs start to skyrocket. Besides the cost of the crane there are many other considerations - including the eventual removal of the portable when it is no longer needed. 3. The proposed site isn't level and needs lots of work to accommodate a portable classroom. The costs involved in site work can also skyrocket if the "building pad" needs soil testing, compaction, concrete footings, underground utilities and asphalt parking and drop off zones. If you think you may have a "site challenge" for a portable classroom I recommend inviting a portable building representative to your campus in advance of making any other decisions. This will give you a clear idea of how much work will be involved in mobilizing your new space - without demobilizing your budget. 1. Churches in newer communities often experience fast growth and need to add space quickly. When there's no time for new construction modular is fast and affordable. 24' x 60'. If you've read enough already you can quickly start your search by using our Compare Prices tool - it takes no time to complete. In many cases these used modular classrooms can be purchased, delivered and installed for under $25,000.00. Prices can vary depending upon the site conditions where the modular will be installed and site specific needs such as access stairs and handicap ramps. 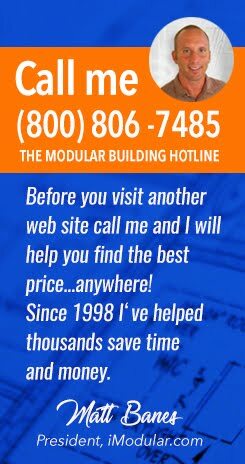 Nearly every day I field calls from around the United States from people looking for help finding a used modular building - and it never gets old! I'm amazed at how many businesses, schools, churches and government organizations need space for reasons ranging from overcrowding to emergency disaster relief and everything in between. The most common recommendation I make is "be flexible" if you need a modular building delivered and installed quickly. What does be flexible mean? It's not a play on words - after all modular buildings are designed to be flexible so I am referring to important features like the floor plan, door and window locations, interior and exterior finishes and so on. If you can be flexible with these particulars your chances of finding a used modular building and having it up and operational quickly are far better than being too picky. Needless to say, being flexible also leads to finding a good price from a local supplier.